This camera was imported by me from the USA. However, there is a small sticker inside the film compartment stating to us Kodak 620 film. This in itself is not strange but it is in French! (CET APPAREIL N'EMPLOIE QUE DES PELLICULES KODAK V 620, S.S.620, F 620, N.C.620). 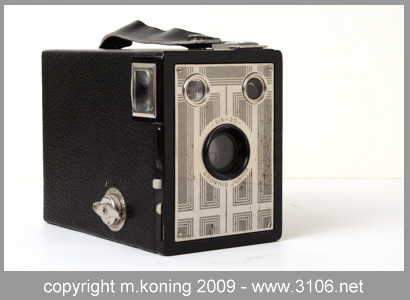 How on earth did a french label get to an American camera, especially when this is also the US model? Well, maybe it was once bought by some French who then emigrated to the US - maybe in the 1950s when emigration to the USA was fashionable? But anyhow a nice detail. 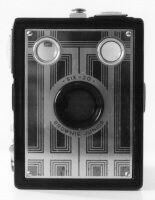 Apparently the Kodak Six-20 Brownie Junior has been very successful. Probably because of the nice Art-Deco metal front plate. My camera came with a non-original replacement strap, some small spots on the metal front but with clean view finders, perfect leatherette and a perfectly clean inside. All functions work properly so it could be used instantly. 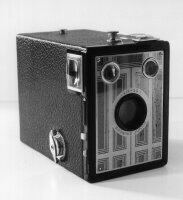 Kodak made their box cameras to be inexpensive and simple to operate, which is exactly what this camera does too. You open the camera by carefully twisting the curly knob on the right hand side of the camera and pulling it outwards. Then you pull the front lever which also connects the strap to the camera and the entire front slides out. You then put in some fresh film in the top, pulling the film across the back and spooling it onto the emtpy spool at the bottom. Then close the camera.  The shutter is operated by moving the lever on the bottom righ hand side (with the lens towards the topic to be photographed) either up- or downwards. Either way will take a picture. Pull the lever just above the shutter out for bulb mode or push it in for normal operation, which is a shutter speed of about 1/30 second. The lever on top, just above the front plate, controls the aperture: push it in for the larger hole (cloudy weather) and pull it up for sunnier times. 2 viewfinders are available for portrait and landscape orientation. 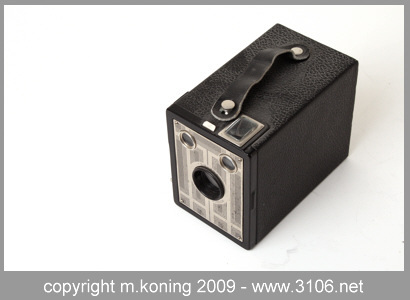 Kodak box cameras auf Mischa Koning's Kodak classics website.